Corpus Collusion announces The Recipe Box version 1.4.1 — an extraordinary app that turns an ordinary iPad into the perfect kitchen companion. It’s the most magical way to create, display, and manage an iPad user’s own recipes. Featuring support for the iPad 2 camera, AirPrint, and AirPlay, The Recipe Box from Corpus Collusion is available from the iTunes App Store for $3.99. Nothing builds cooking confidence like being organized, and The Recipe Box takes the worry out of the way. Cross-referencing under several customizable categories lets users find a recipe by course, cuisine, season, and more. Users can browse recipes with a simple swipe, dim ingredients while collecting them, and track steps in multiple recipes. Entering a recipe is easy with the useful extra keyboard that offers numbers, measures, and cooking terms. 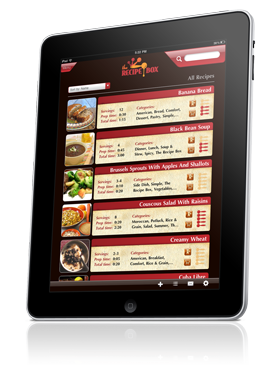 Once created, The Recipe Box magically transforms recipes into works of art on the iPad, in email, or print. What’s more, this virtual cookbook can display home cooking shows made with the iPad 2 camera on the user’s Apple TV. The Recipe Box fits squarely into today’s food revolution with its focus on local ingredients and organic cooking. Customers want to eat less processed food, and share their favorite methods with friends. The Recipe Box lets users collect recipes from anywhere to have in one central location.